I truly do feel so lucky when I consider all the projects I have worked on in the past. Whilst weddings are a joy and introduce me to people from all walks of life, my commercial photography takes me to locations I would never have seen, whether it’s product photography, food photography, or in this case, jet interior photography! Indeed, recently I got the chance to feel like royalty as I was commissioned for a project with a private jet company. The project theme was “Skysleep” and required me to photograph the insides of a stunning private jet which could cater for up to 16 passengers plus crew members. My brief was to make the jet interior look how it would whilst it was in use, so this was very much a lifestyle photography project. I had to put myself into the shoes of the private jetsetter (a life I could surely get used to) and experiment with the setting a little. This was a joy to do – all of the seats could be converted into beds at the touch of a button, so I enjoyed playing around with the aircraft’s settings to get my shots. First up were the aforementioned beds – keeping the “Skysleep” theme in mind I had to photograph these made and unmade, but both styles had to look inviting for the user. I visualised the jetsetter and used props to my advantage here to make this work, including carefully placed pyjamas and duvet covers. The team also threw another challenge into the mix with some food photography. I had to photograph breakfast, lunch and dinner meals all as they would look to a genuine user, some of whom will even be lucky enough to have breakfast in bed! Later on I also experimented with some of the other amenities on-board. The company clearly leave no stone unturned when it comes to catering for all customers, and there was a selection of items for children including books and cuddly toys. These all made for stunning close up shots and will certainly help to sell the product. While jet interior photography is a first for me, I certainly hope it won’t be the last. It was hugely enjoyable to be a star for a day and see just what opportunities there are out there for luxury lifestyles. With the varied menu and the exquisite library of books, I must confess I found myself getting a little jealous of this company’s customers! These particular photos will be used both in print and online, which is always lovely to see as a photographer. While I stand by the incredible standards of digital on-screen images that we see today, it’s also lovely to have a finished product in your hand. 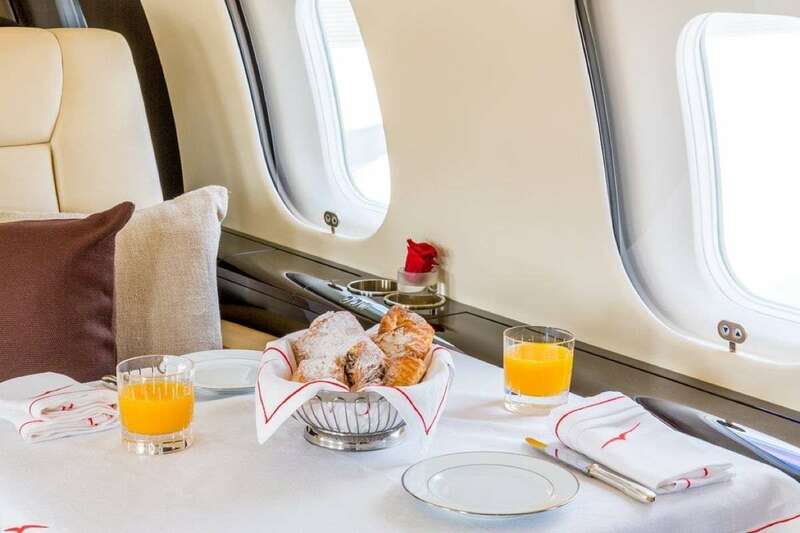 I like to think I fulfilled the brief of making this private jet look inviting, though I have to give credit where credit is due – with their luxurious comfort and exquisite design, they did a lot of that themselves.